Globalization - Whose Values Will Prevail? - As we continue to globalize, in a diverse world, Finance and Trade in goods and services, whose values will prevail? - And what will the impact be on Luxembourg and Investment Returns? The presentation by Tony will be followed by informal food and an opportunity to meet and talk. Tony de Luca is an Adjunct Professor of Management and Finance at Sacred Heart University, Jack Welch College of Business, and a frequent lecturer and corporate seminar leader. Tony’s main objectives are helping students build successful careers and rewarding lives and helping companies and their executives get the best out of each other for top performance. 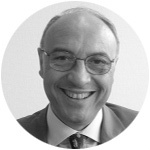 Tony has previously taught Management and Finance at Boston University in Brussels. In the words of one participant: "Interesting ideas! important topic! good discussion!"